Cartridge filters are offered in a wide range of materials and configurations. They can be a surface or depth-type filter: depth-type filters capture particles and contaminants through the total thickness of the medium, while in surface filters (that are usually made of thin material like papers, woven wire and cloths), particles are blocked on the surface of the filter. Surface filters are best if you are filtering similar-sized particles. If all particles are five micron, a pleated 5-micron filter works best because it has more surface area than other filters. Compared with pleated surface filters, depth filters have a limited surface area, but they have the advantage of depth. We also offer membrane filters that provide sub-micron filtration for demanding applications. 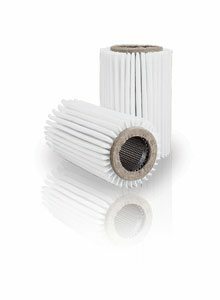 AFF’s membrane filters are surface filtration style cartridges that provide sub-micron filtration. We offer filtration form .03 to 20 microns in a wide range of end cap configurations. Our cartridges are also compliant with FDA Title 21. AFF’s pleated filters are available in standard and high efficiency configurations. They are manufactured from polyester and polypropylene medias. Standard diameters are 2.5” and 4.5 “ and up to 40” of length. All seams are ultrasonically welded to avoid any bleed through. Polypropylene elements with polypropylene cores meet FDA Title 21 regulations for food and water contact. Custom sizes are available. AFF’s melt blown cartridges are manufactured from polypropylene or nylon. They are made with or without a core and can be manufactured in a wide range of sizes. End caps are thermally welded so binders or other contaminants won’t get into the products. String wound cartridges are an excellent low cost liquid filter cartridge. String wound cartridges are available in several particle retentions, materials and lengths. Bleached cotton and polypropylene are FDA acceptable. Glass is highly resistant to corrosive agents and withstands temperatures up to 750 degrees F. String wound filter cartridges are available in bleached and natural cotton, polypropylene, and glass media with cores available in polypropylene, stainless and tin steel.